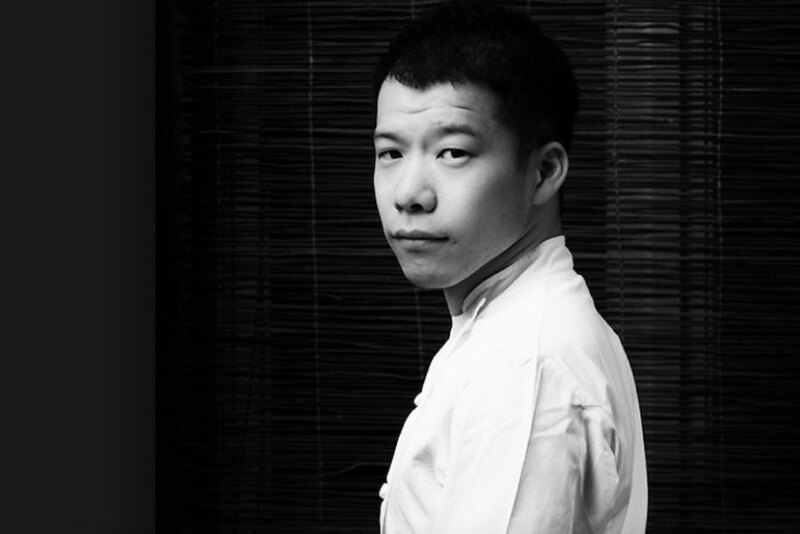 The magical partnership of patron and Maître de Maison Guillaume Guedj and acclaimed Japanese Chef Shinichi Sato creates Passage 53, a two Michelin star dining experience hidden away in one of Paris’ amazing “passageways” tucked in between buildings in the centre of Paris. Another somewhat obscure place with little internet presence. 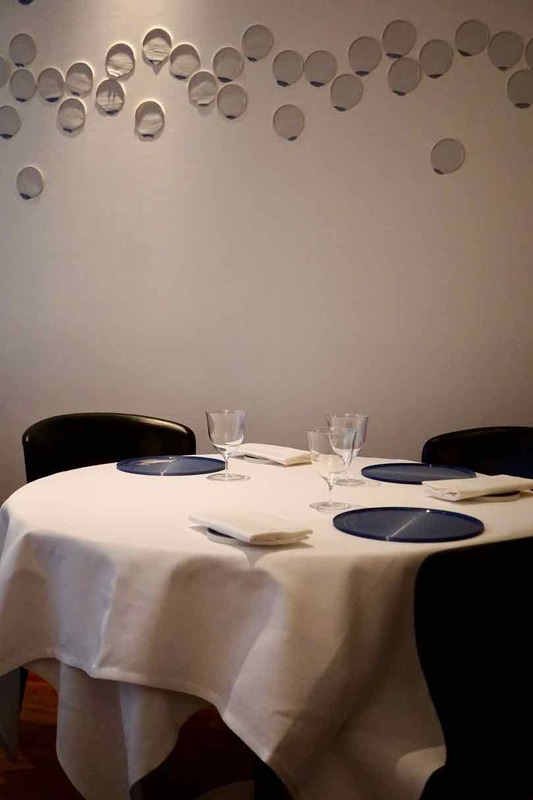 Only the halo of two Michelin Stars tips us off to its existence. 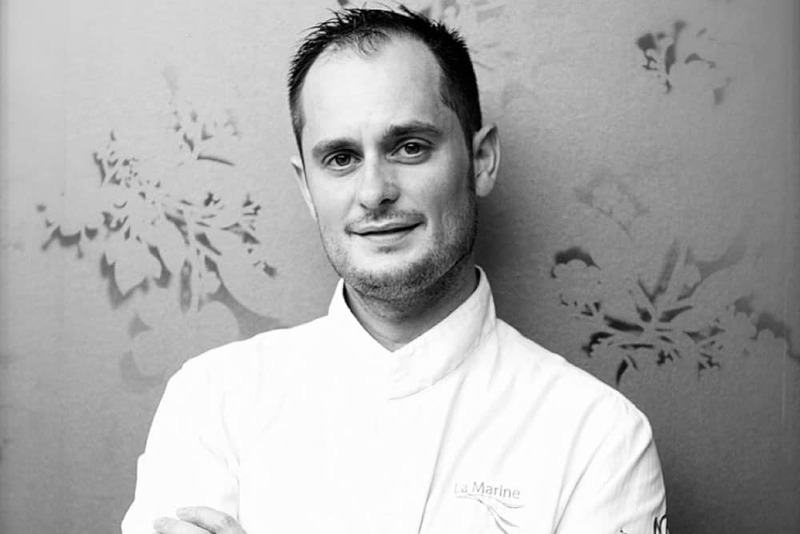 With a bit of digging I discover that Guillaume is a son in law of famous butcher Hugo Desnoyer. 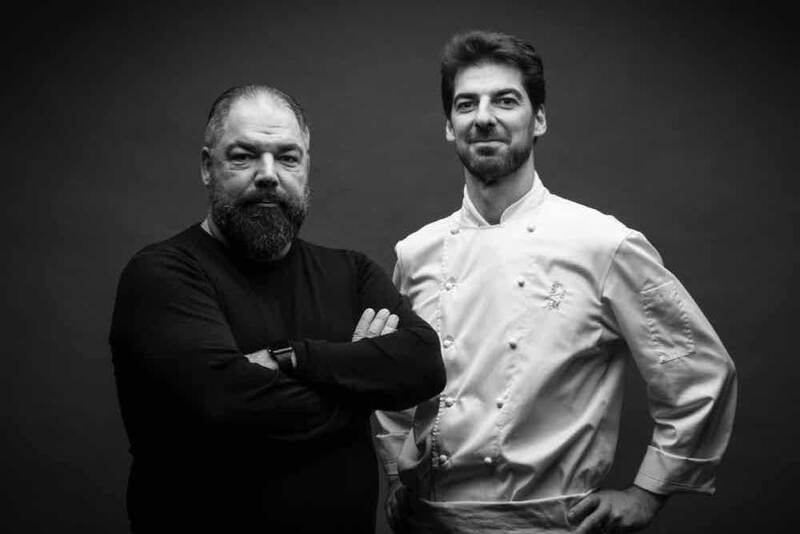 Having known chef Shinichi Sato from his time working at L’Astrance, one of Paris’ three michelin star restaurants, Guillaume offered Shinichi the head chef position when he started Passage 53. It was an opportunity for Shinichi to do things his own way and to begin to express his own cuisine. 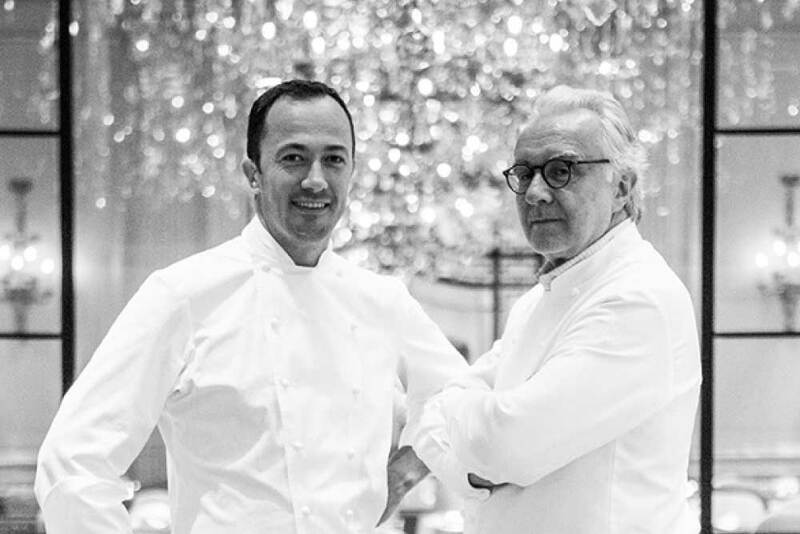 The partnership of the two has proven to be a creative success with Passage 53 swiftly securing two Michelin Stars. In the 19th century, fascinating passageway arcades were created by covering tiny lanes between buildings with stunning glass roofs. It is a beautiful time machine moment, where entering the passage instantly transports you to another time. 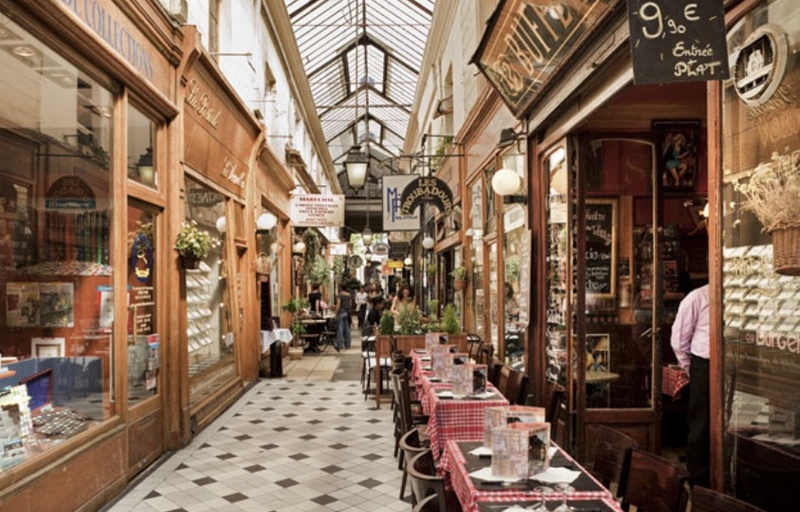 Wandering through the passages today we find all manner of shops, tea rooms and restaurants. We are looking of course for Passage 53 but it’s understated shop front, similar I guess to its website, means we walk right on by. I confess I was distracted by jewellery and other sparkly things, but my love was focused on the hunt. It’s only when google tells us we have gone way too far that we turn around and look again. Finally we find it! Right opposite the jewellery shop I was gawking at of all places! Inside, the space is very neutral and minimalist, with timber floors and white walls. I rather like the artwork which is circles of plaster stuck on the wall, all the same colour, with the tiniest splash of blue on the lower edge. I’m not sure what it represents but my imagination runs to bubbles, perhaps thought bubbles, ideas floating on a blank sea of possibility? It is a small space, only around eight tables, sixteen covers. There is a tiny spiral stair case on one side. We are seated just beneath the staircase and I ease gratefully into a very comfortable chair. Much sought after and seldom found in Paris is the really comfy chair. If we expect to be parking le derriere for some time, one of the things we look for is a comfy chair. There is nothing that will quite distract you from a lovely meal as much as being physically uncomfortable. While the chairs are comfy, the table height is strangely low and I am not quite sure if it feels good or not. On one hand I try to convince myself that we will have a nice, kind of birds eye view of the food but on the other it feels a little like parent teacher night at the children’s preschool where the grown ups are perched at the children’s table ready to be regaled with presentations of glitter covered egg carton sculptures. The next thing that I am absolutely fascinated with is the exquisite glassware. Beautiful fine glasses on the longest narrowest stems I have ever seen. Almost too delicate to touch. My mind runs from ‘oooh pretty’ to ‘how many of these have they broken in the glass washer?’ and then ‘do they even fit in a glass washer?’. My love distracts me from my wandering thoughts by arranging to have golden wine poured into the pretty glasses which means I have no choice but to take a deep breath and pick one up and drink from it and it feels very special. 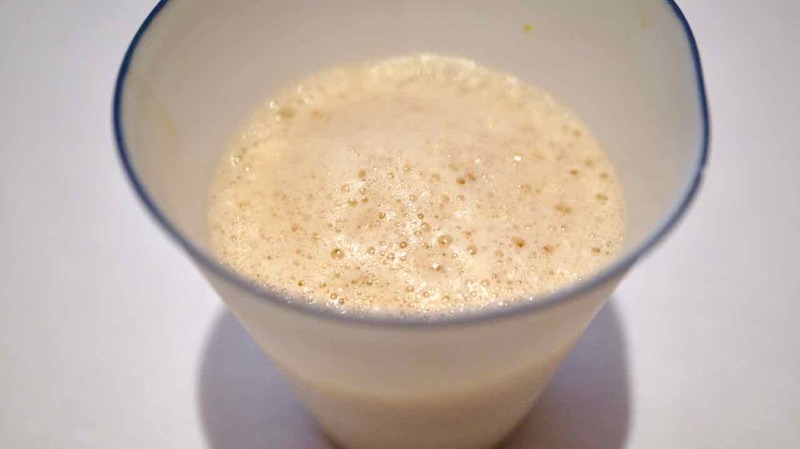 Our menu starts with a small cup of pumpkin volute topped with a coffee and milk foam. It is clear form the number of pumpkin volute’s we have enjoyed of late that it is definitely pumpkin season. The combination of sweet pumpkin with the astringent slightly bitter coffee notes is fantastic. I am particularly mesmerised with the paper thin delicate ceramic cup, so fine it is translucent. A feint blue edge reminiscent of the wall artwork. So very pretty! Beet Carpaccio is the next plate and it is bright and colourful. Different types of beets, some shaved and some finely diced. The earthiness of the beets invigorated with the warmth of horseradish cream and wonderfully sour, tart intense yuzu vinegar. The deep golden some times knobbly skinned Japanese yuzu is such a fabulous uniquely flavoured citrus. 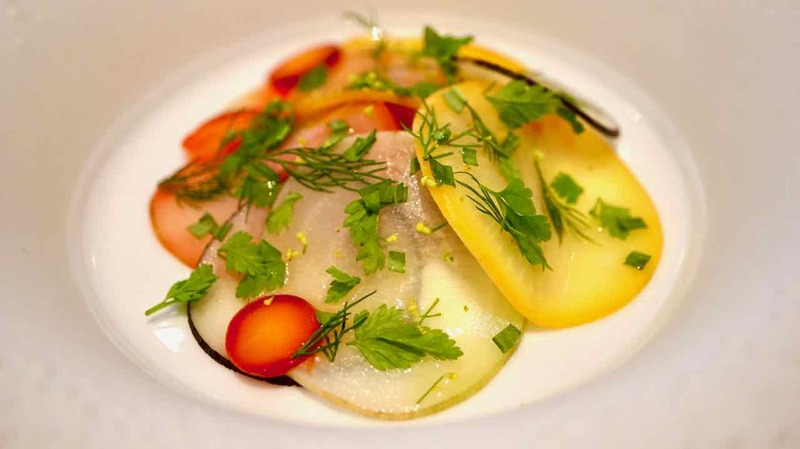 A gloriously refreshing dish. The next plate is wonderfully surprising. What looks like the reflection of a golden sunrise in a shallow pool, deeply rich gold on one side and the gradient lightening to a pale yellow on the other side of the plate. It is glassy and translucent, but the delicate first impression of this plate is only the beginning. 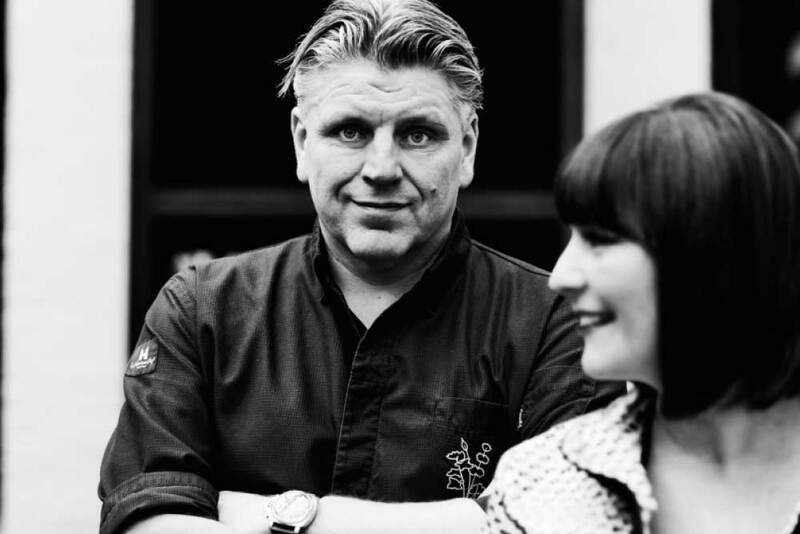 The bowl is deceptively deep and digging down below the surface of the seaweed jelly, we discover a hidden vortex of sea urchin and smoked haddock cream. Just beautiful and a fabulous surprise. Now I think I have figured out that the kitchen is upstairs. There seems to be an endless tappy tap of footsteps up and down. I can’t help but think that not only do the crew steam it up over the stoves all day but they also have to run up and down stair all day and night. Amazing! Scallops presented in an elegant white bowl, bathed in a parsnip volute and accompanied by onion ravioli are set down before us. Now this is a genius dish, the scallops are lightly caramelised and perfectly translucent. The parsnip volute is wonderfully earthy and creamy and the onion ravioli are so deeply sweet and delicious. The smallest but most significant touch of genius is crispy potato crumbs on top of the scallops. 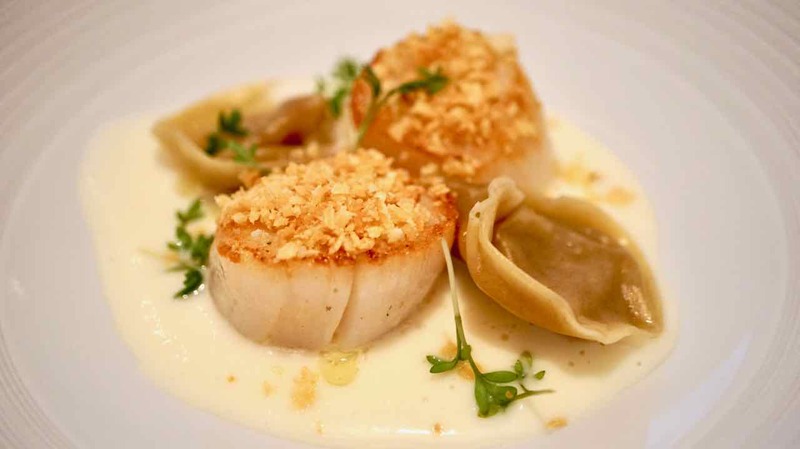 The crunch and the saltiness is such a brilliant accent to the sweet tender scallop. Very, very clever and yet so simple! Tappy ta tap down the stairs comes another exceptional taste. This time Monkfish with clams and artichokes in a white wine and butter sauce. 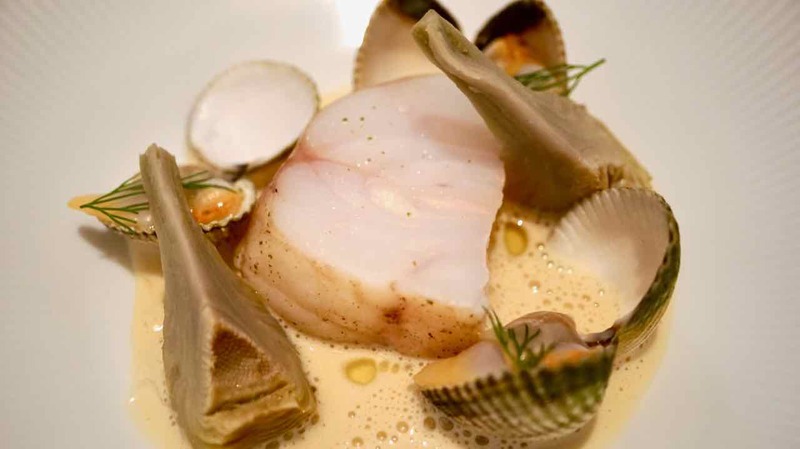 The combination of flavours on this plate are uplifting, there is a smokiness to the artichokes, the dear little clams are fresh and sweet and salty all at once and the fish is delicately cooked, only just there, still translucent. The winey buttery sauce pulls everything together beautifully. A very delicately balanced dish. The next plate is inspirational. 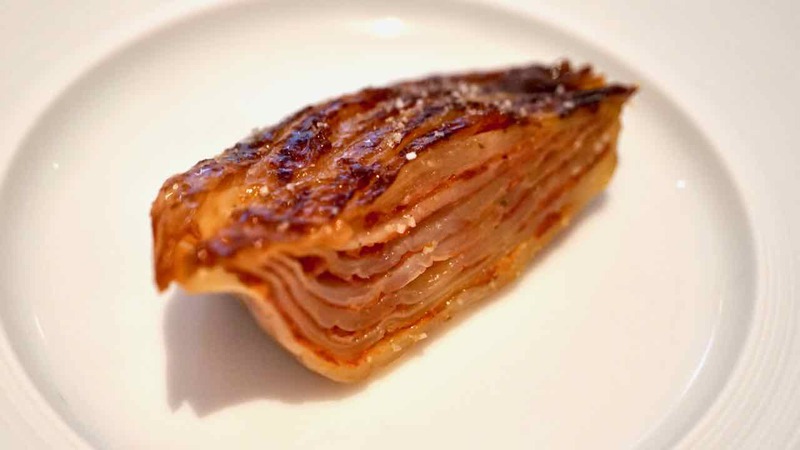 Onion layered with Iberico ham. It sticks to my teeth like toffee while I eat it, making me feel a little like a cheeky child having snuck a toffee. I close my eyes for a moment and imagine the preparation of it. A quarter of an onion, each layer with paper thin slices of ham tucked in between and then roasted till exquisitely sweet and sticky. Part of me can’t wait to get home and try making something like this, the other part me is going who on earth prises apart an onion and slides skinny slices of ham into every layer? 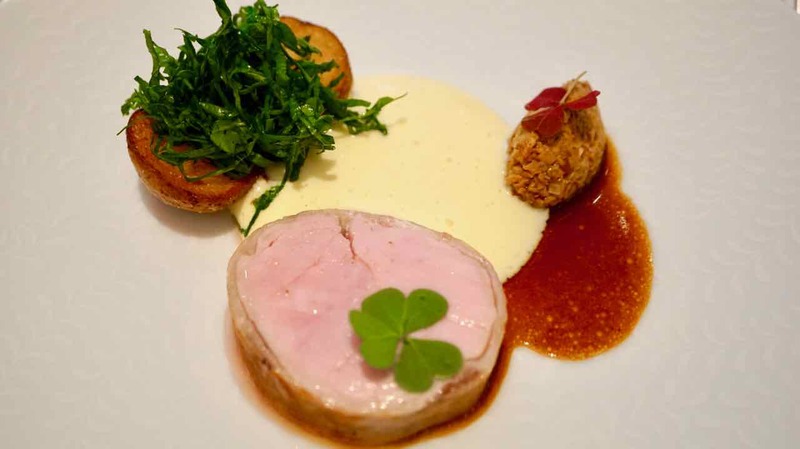 Veal is the hero of our next taste from Chef Soto’s kitchen. It is pale pink and very delicate. Served with a quenelle of finely chopped chanterelle mushrooms, crispy roasted potatoes and a light creamy cheese sauce, this is a lovely comforting dish. 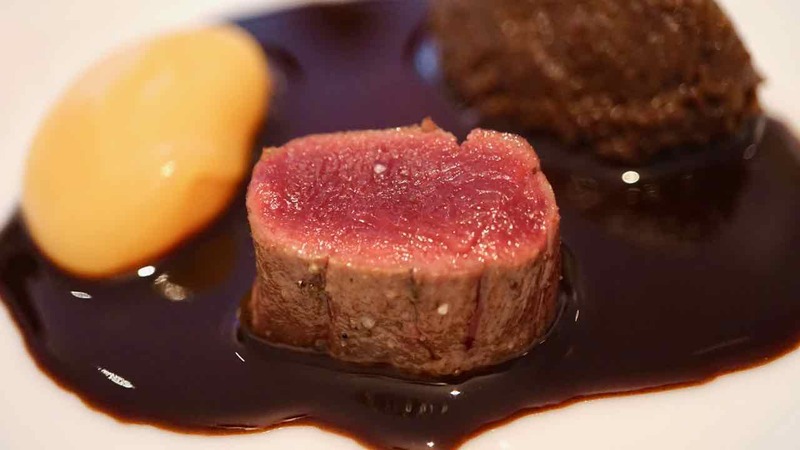 It’s hunting season in France and for our final savoy course we have wild hare, fillet mignon and slow cooked hare with a red wine sauce, quince purée and chocolate. This dish is so rich, deep flavours of the velvety sauce align perfectly with the little bites of the meat. The fillet pink and tender and the slow cooked braise sweet and soft. Both fascinating expressions of the hare. We move on now to the sweet part of the menu with a wonderful collection of desserts. 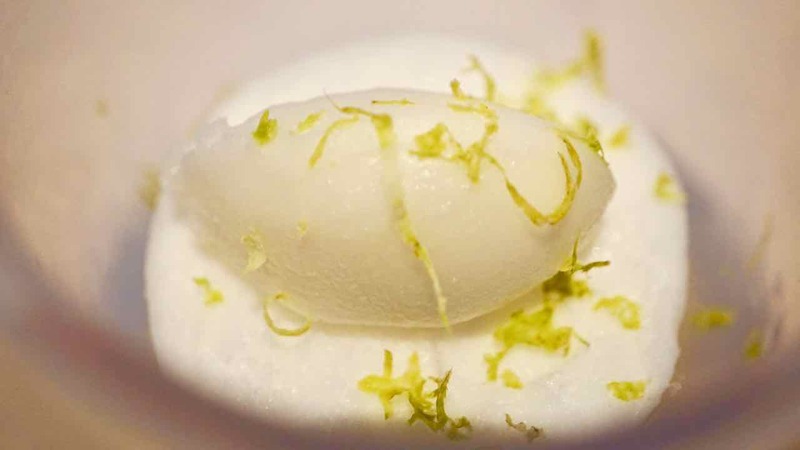 Lemon meringue which is like a little lemon meringue pie, with lemon curd hiding under meringue and with a zippy zesty sorbet on top. It is refreshing and light and wakes the palette up all over again. 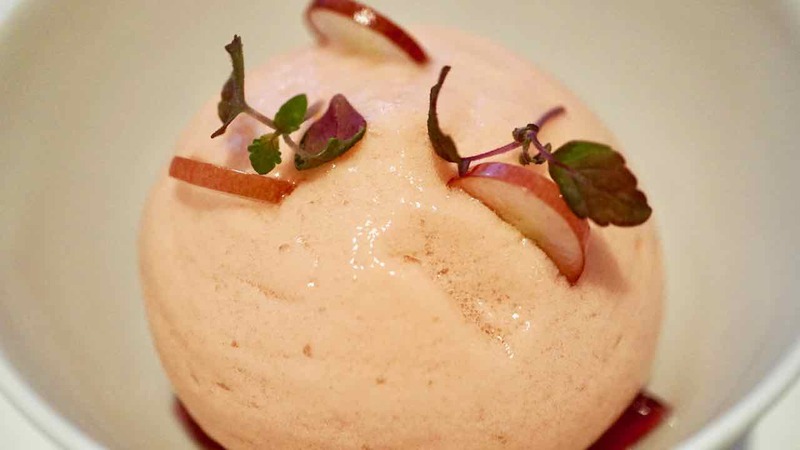 Next a grape mousse, a pretty pink ball of incredibly light creamy mousse that is a delight on the tongue. 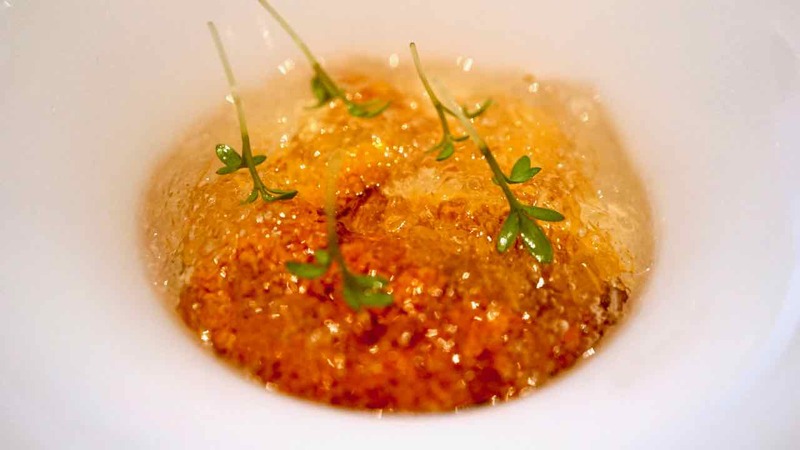 Served with an ice cold shiso jelly that has a lovely fizzy effect. The delicate almost minty but so much better flavour of the shiso with the sweet grape is a winning combination. Tiramisu Mont Blanc, now this is a twist! 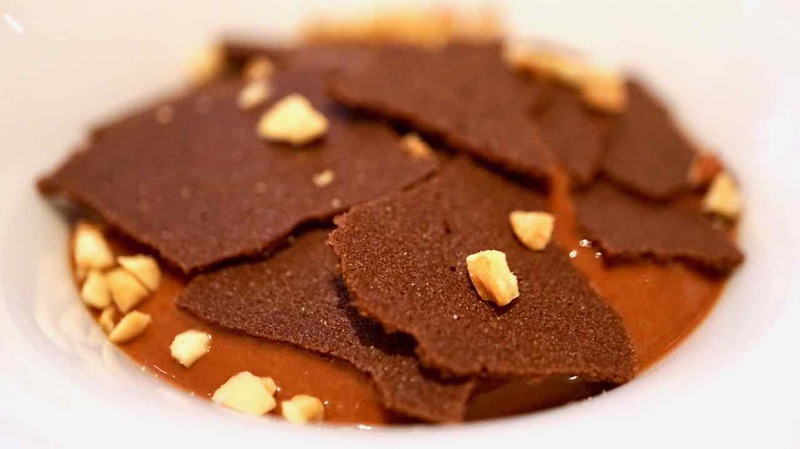 Chef Sato has taken the traditional French dessert Mont Blanc and created a Tiramisu version. 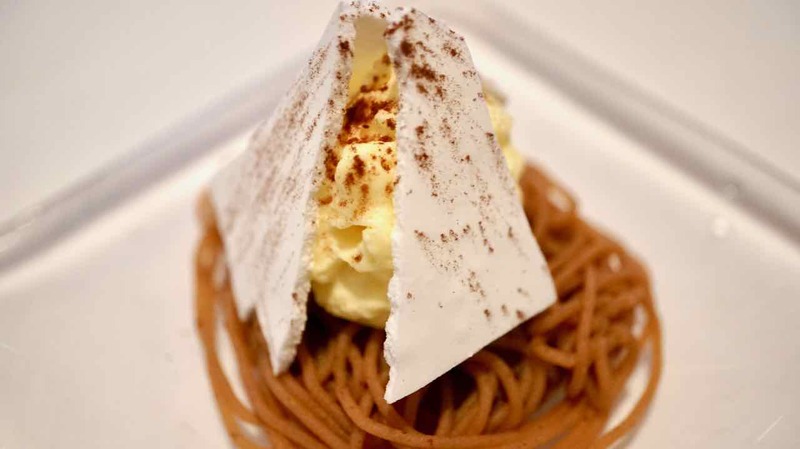 I remember when I first came to France I wondered what the little mounds of wholemeal spaghetti were doing in the patisserie, not realising it was actually a piped chestnut purée. 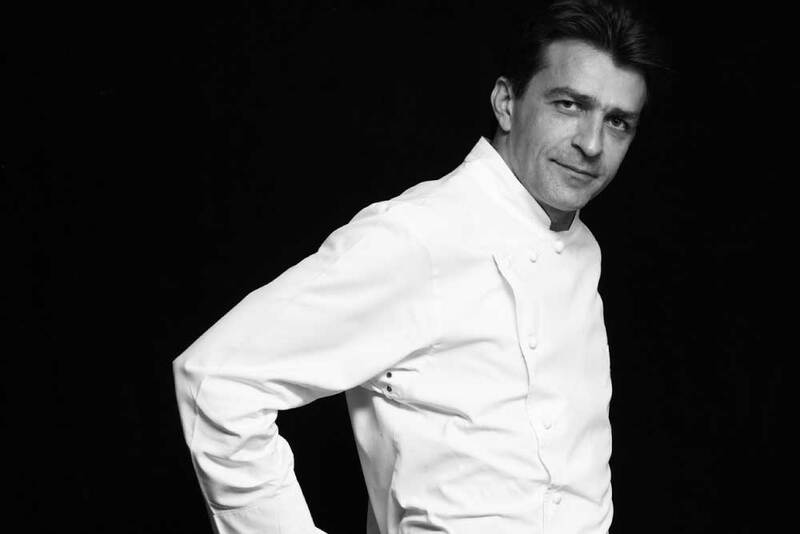 I wonder if Chef Sato also saw spaghetti when he had his inspiration to meld the Italian and French cultures in his brilliant version. The strong coffee flavour was just perfect, a real pick me up of a Mont Blanc. And for our final sweet treat, chocolate banana. A lovely little bowl with layers of yumminess. Light moist banana sponge cake hides beneath chocolate mousse and shards of crispy chocolate biscuit. Now that we have wrapped up our meal I am feeling the need to make use of the bathroom facilities. I am directed up the little spiral stair that we have sat beneath listening to footsteps all afternoon. I just have to make a note of it in my journal, it is so, so tiny, a narrow little stair with treads that cannot accomodate a full foot and spiralled so tightly it feels like each step is a ninety degree turn. I squeeze my way up and pop out at the top to discover that the top floor is the absolutely spotless kitchen. Despite our last plate having only arrived a short time ago, the kitchen has been cleaned down so you would think it is deserted and no one works there. It is simple clean lines of bare stainless steel. To the other side a bathroom door. I feel lucky to have had a little peek at the kitchen. I just think it is amazing that they turn out such amazing food in such a small space and have to run it all down the narrowest staircase in the world to get it to the tables. We have had a fantastic meal filled with lots of inspirational moments. Guillaume has focused his attention on one table all afternoon, chatting with two chaps that he seems to know. We have enjoyed quiet subtle service where the food has been left to speak for itself. 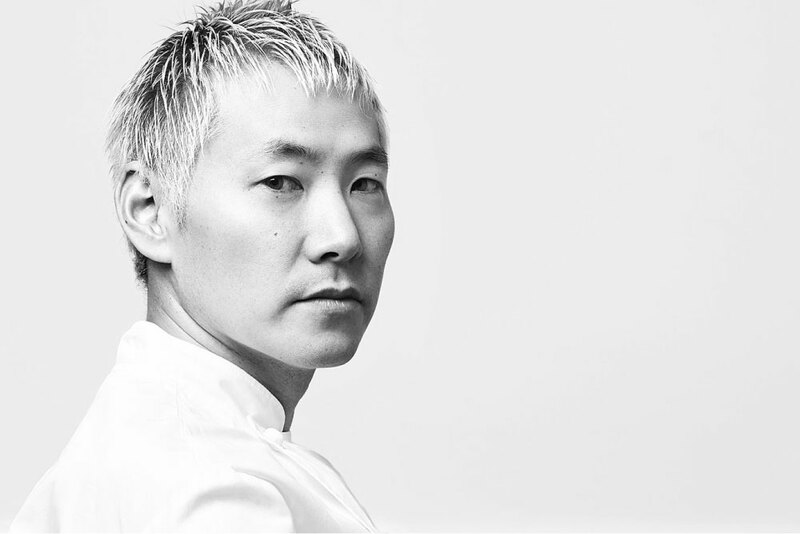 I think chef Sato is a star in the making with great creative energy. I hope for him that his gentle creativity continues to be recognised.